Logistics Support sailors keep track of supplies and parts for all ship, squadron, and shore-based activities. If a unit needs a part for repairs, the LS helps them get it, which is especially key if the item needed is highly specialized. This Navy job is equivalent to the Army's military occupational specialty (MOS) 92, Automated Logistical Specialist. These sailors use financial accounting and database systems to perform inventory and financial management functions. In addition to sorting all official and personal mail, logistics support sailors manage money order and stamp inventories, and maintain financial and inventory reports. They order, stock and issue clothing and general supplies, keep databases and correspondence files and manage Navy post offices. This includes sorting and distributing post and packages and routing and directing the transportation of mail. These sailors often perform counter operations similar to those at United States Postal Service offices, such as selling stamps, handling money orders, preparing claims, tracers, and inquiries and preparing and maintaining postal records and reports. The list of duties for logistics support sailors at the Navy postal office is lengthy, and includes requisitioning, controlling, and maintaining postal supplies and equipment; and maintaining security for registered, certified and other special classes of mail. LS sailors work in offices, shore-based warehouses, air cargo terminals at naval air stations and in storerooms aboard ships. While they work closely with other people, their tasks usually require independent decisions. 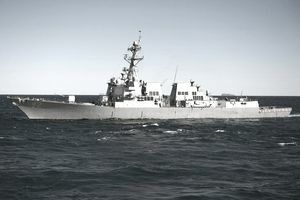 Although it's primarily an office job, LS sailors may be stationed in combat zones or on Navy ships and bases anywhere in the world, including Afghanistan and Iraq. The skills you'll learn if you enlist in this rating will train you for a variety of civilian careers. You should be able to seek work in financial management, warehouse management, inventory management, and procurement across many different sectors. After the requisite boot camp at the Great Lakes Naval Training Center in Illinois, sailors who enlist in this job will spend 40 days in A-School at Naval Air Station Meridian in Mississippi. To qualify for this rating, you need a combined score of 108 on the verbal expression (VE) and arithmetic reasoning (AR) segments of the Armed Services Vocational Aptitude Battery (ASVAB) tests. There's no Department of Defense security clearance required for this job. What Does a Navy Ship's Serviceman Do?